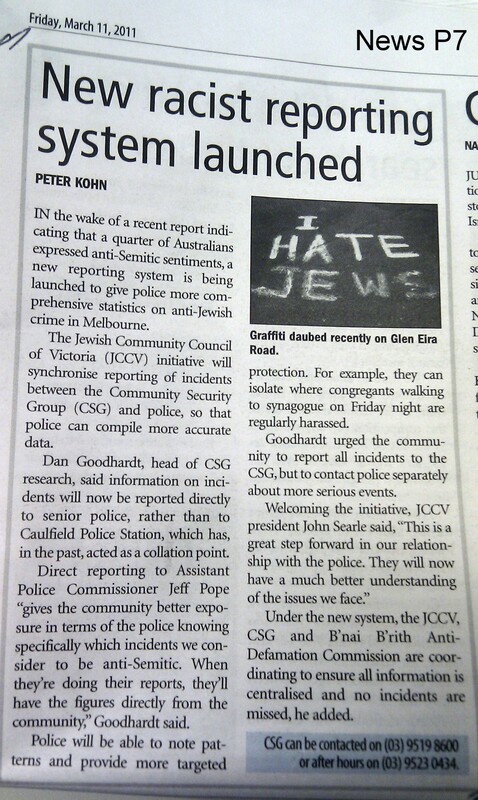 This week the Australian Jewish News advised that the Jewish Community Council of Victoria (JCCV) has launched a new reporting system for anti-Semitic incidents. They’ll be working with their Community Security Group and Victoria Police. That’s good news. This sort of hate needs to be identified and countered. No doubt they will. The JCCV are not shy at bringing “the issues we face” to the attention of the community and authorities, when they are so motivated. I have a message for JCCV president John Searle. Next time you’re on the phone to Victoria Police, please ask them to transfer you to their Gay and Lesbian Advisory Unit. Please tell the GLAU that GLBT members of the Jewish community face homophobia, intolerance, marginalisation, hate, discrimination and contempt and that the JCCV tolerates and contributes to these attitudes originating from both within and external to the community. Please tell the GLAU that the JCCV sees GLBT people as inferior members of the community, to be feared, and does not believe they are worthy of being admitted as members of the JCCV because they are perceived to be a risk to community stability. Victoria Police needs to know that the JCCV is a serial bully, constantly crying out against anti-Jewish attitudes, but simultaneously perpetrating anti-gay attitudes and intolerance. The JCCV is not playing the game fairly. It plays by its own duplicitous rules, doing what it wants, when it suits it. Time is up JCCV. The Jewish Community bully is a bad boy and it needs a really good spank. This entry was posted on Thu, Mar 10th, 2011 at 1:39 pm and is filed under Humanity, Justice. You can follow any responses to this entry through the RSS 2.0 feed. You can leave a response, or trackback from your own site.